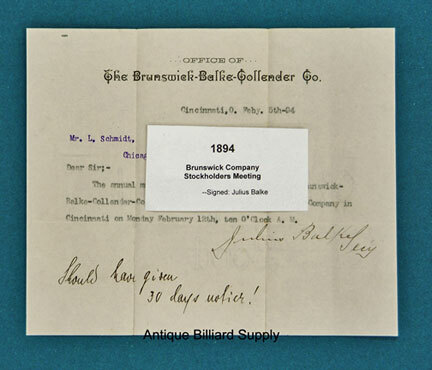 #12-05 A very rare document signed by Julius Balke, who at the time was corporate secretary of the Brunswick-Balke-Collender Company. Addressed to Leo Schmidt, another corporate officer, this tells of scheduling the annual meeting of stockholders on February 18, 1894. A notation at the lower left, presumably by Mr. Schmidt, complains of the short notice. Original document on Brunswick stationary, not a copy. A one-of-a-kind piece of history. About 8 inches wide and 7 inches tall. $2,000.00.